Just Romantic Suspense: AMERICAN WRITERS ROCK! 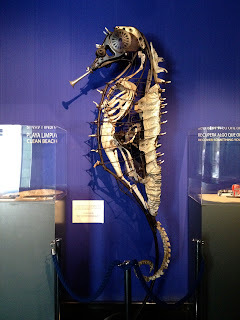 Don’t you just love that steampunk sea horse? I couldn’t take my eyes away from it and just had to share. To my good fortune, I’ve been to Berlin, Germany and Valencia, Spain in the course of the past month. Both fascinating cities, and both fascinating countries. Berlin was just a delight—it was the first romance readers’ convention held in Europe, organized by the German equivalent of Romantic Times—LoveLetter. German readers love their romances as much as US readers do, and as much as I do. There is just something about romance novels that lights and unites hearts. The convention had a whole slew of US romance writers—my dear friend Shannon McKenna (we shared a room and I can tell you she doesn’t snore), Lara Adrian, Bella Andre, Maya Banks, Tina Folsom and moi. We bonded over our readers’ bonding and had a great time and drank tankards of beer and ate surprisingly good food. Just a feast for the senses. Valencia was more a family vacation, museums and beach time and restaurants. For culture, in Berlin it was the Museuminseln and in Valencia the Ciudad de las Artes, with its enormous Acquarium—the largest in Europe—and the steampunk sea horse. However, I am also a book freak so in both countries I roamed the aisles in bookstores and was once again struck by how popular American genre writers are in Europe. Bestseller lists are crammed with American names—my romance friends above, plus Nora Roberts and Heather Graham, and many others. Lee Child, Michael Connelly, Jeffrey Deaver for mysteries and thrillers, in science fiction/fantasy George R.R. Martin, Neil Gaiman, Neal Stephenson, Greg Bear… The list could go on and on. Perhaps literary fiction doesn’t travel as well, with a few exceptions. In the main, nowadays literary novels are preoccupied with the minutiae of precise observations of time and place and class. This often doesn’t travel well. But whether King Joffrey can hold on to the Iron Throne, how the Starks will withstand the coming winter and the vicissitudes of Westeros—WELL, anyone, anywhere can follow that. Somehow American genre writers can create worlds that can grab readers and pull them across the ocean into their world. There are a number of reasons for the primacy of American genre fiction. We have very strong professional writing organizations. It is very possible to make a living wage by writing, something that is almost impossible in Europe. Professional writers write more and the more you write the better you get. It’s an iron rule. We have a whole library of superb writing books, starting from Stephen King’s On Writing. But the thing that in my opinion distinguishes us from writers from other cultures is a sort of camaraderie, a Brotherhood of the Pen or Sisterhood of the Keyboard. In my time as a romance writer, I’ve been helped more times than I can count by colleagues, often by writers who don’t even know me but are willing to lend a hand. Read the acknowledgements page of any genre book and chances are you’ll find a writer thanking another writer for his or her help. We have online loops where we talk to each other constantly. We blog for each other, we root for each other, we do research for each other, we give each other blurbs, we recommend writer friends to our editors and when we fall ill more often than not we raise funds for each other. It makes a difference. A huge difference. Writing is—yes-- a lonely job but the whole point of writing is to connect. And if, behind the scenes, you are connecting with others doing your exact same noble, impossible, frustrating job and giving you encouragement and help, your books cannot help but be the richer for it. So I think our primacy on the bestseller lists throughout the world is the opposite of cultural imperialism. It is the very expression of human solidarity. That's so true. And when you're feeling down and out, they're there to lift up your spirits too. Good to hear that LoveLetter had a good turnout. At the RWA Washington DC conference, I had the pleasure of meeting two of the ladies who worked for them. I love this post! It's so true. If it wasn't for RWA, I never would have gotten a publishing contract. My RWA ladies are the best! Good post. Love the cover.